It is no accident that takes place in Cannes since 1859, the venue of the Yachting Mondial. Only a few bays offer as many stimuli as in this environment. The changing breezes are not always easy to assess, but it is part of the attraction. 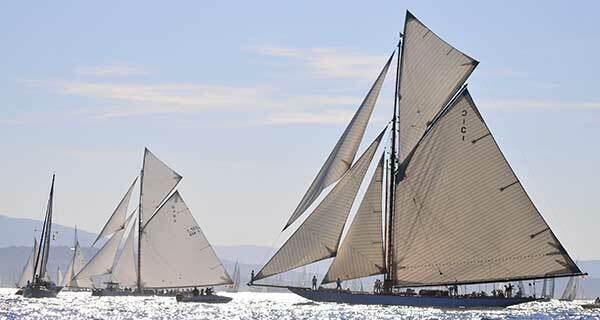 For more than a century here, the most beautiful sailing yachts against each other. In these bays harmonious with the Isles / Islands and the Esterel Hinder reason the Mercantour Alps. For more than 70 days in various regattas are held in the bay of Cannes. They are organized by the four nautical yacht clubs. It is undeniable that the Royales regatta with one in the last week of September to the peak of the season. It gathered more than 150 yachts sometimes the most beautiful classic yachts from 10 - 50m.Für one weeks these beautiful sailing yachts against each other. They are often more than a hundred years old, it is always a tough but fair fight. When navigating in the vicinity of the beaches or bars, they offer a show of rare beauty. Hundreds of spectators and fans of classic yachts come with experience from across Europe to this spectacle. To Royales regatta every year gather more than 150 yachts of all sizes, with more than a thousand crew members. In addition there are technical assistants, visitors, and of course the national and international press, not to mention the race committee, the international jury, institutional and commercial partners. A total of 1,500 people live on the premises of the Vieux Port de Cannes, provided by the Regates Royales. The surrounding hotels and restaurants on the harbor offer a cozy atmosphere with a view of the towers are lit at night. For individual bookings this year, we also offer the opportunity to actively participate in the regatta again, this time with the 80-foot cutter Gaf Marigold 1892.